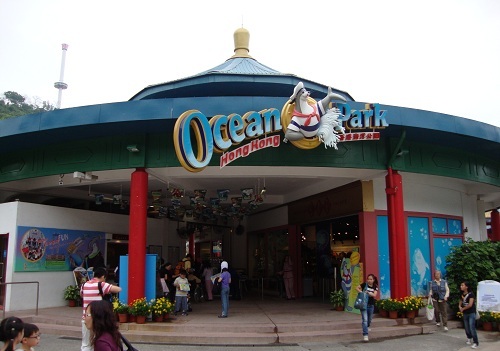 Ocean Park Hong Kong is an amusement park found in Aberdeen on Hong Kong Island. It’s a very popular tourist attraction among people of all ages. Inside the park you’ll see all different kinds of rides such as roller coasters, Ferris wheel, log ride, spinning swings and even a hot air balloon ride. Anyone looking for some exciting rides will surely have a fun day at Ocean Park. When you arrive at Ocean Park, take a look at the iconic main entrance and get your ticket into the park. You’ll want to pick up a map of the park as soon as possible so you can plan out where you want to go and what you want to see. The Whiskers Harbour is a fun part of Ocean Park where you can enjoy amusement park rides, kids’ playgrounds, and some carnival games. Make your way over to the Whiskers Theatre where Ocean Park’s mascots, the sea lions, put on a fun show with their friends. An interesting part of Ocean Park Hong Kong is Aqua City. The main attraction in Aqua City is The Grand Aquarium. Inside The Grand Aquarium you’ll find the world’s largest aquarium dome, a huge tank with thousands of fish from over 400 species, and an open tank that has many sea creatures you may not have seen before. There’s even a tank where guests can put their hands in the water and touch sea cucumbers, sea stars and an occasional fish. Some of the sea creatures living in the Aquarium include Sea Turtles, Sting Rays, Manta Rays, Sharks and all different kinds of fish. After you’ve seen the aquarium, stop by Symbio. Symbio is a fountain that sprays water into the air in cool patterns. Make sure to come back at night when Symbio really comes to life showing 2 dragons fighting on the world’s first 360 degree water screen show. Ocean Park Hong Kong is the host of several animal exhibits. Visit these animal exhibits to see animals such as Panda Bears, Alligators, Jellyfish and all sorts of predator birds. Four Panda Bears live in Ocean Park Panda Bear habitats. In 2007, two Pandas were gifts to Ocean Park from China to commemorate the 10 year anniversary of Hong Kong returning to China. They are now part of the Ocean Park Giant Panda Habitat. When visiting the Panda Bears, don’t use flash photography as Pandas are sensitive to camera flashes. Head on over to Goldfish Treasures for a chance to see some rare types of goldfish. Inside you can learn about why goldfish are important to the Chinese people. If you’re interested in fish and other aquatic animals, you may enjoy a trip to the Goldfish Market in Mongkok. Since Ocean Park is spread out on 2 different sides of a mountain with a waterway in-between, transportation from both sides are available to all guests. 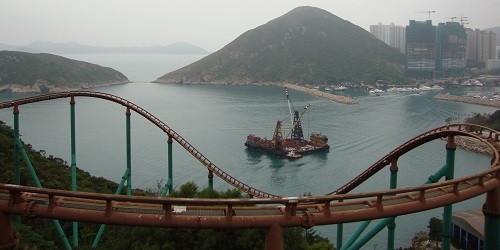 These 2 sections of Ocean Park Hong Kong are called Waterfront and Summit. There are a few ways to get across the sea to the other side of the amusement park. One way to get across to the other side is by Cable Car. These are small carts hanging from a metal wire very high in the air that move across the wire to the other side. Similar to a Gondola. You could think of this as moving across a power line in a cart. 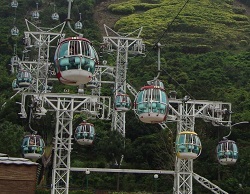 Riding in a Cable Car will provide great views of the park, surrounding mountains and the sea. Another way to get from the Waterfront to the Summit is to take the Ocean Express Train. This train looks like an underwater vehicle and has an underwater theme inside. While the train moves from one section to the other, passengers get a unique underwater experience through sound, lights, and televisions on the roof showing all sorts of underwater animals. A very entertaining way to ride from one end of the park to the other. The final way to get across to either the Waterfront or Summit stations is with the Ocean Park Escalator. This escalator is the 2nd longest outdoor escalator in the world (the longest escalator in the world is found in Hong Kong as well). It’s a long way from one end to the other, so make the best of it and enjoy the nice views of the park and the island of Apleichau. No need to worry about the weather while you’re on The Ocean Park Escalator, there’s a clear dome that protects the escalator from bad weather. Many restaurants are available on site. These restaurants serve all sorts of food ranging from traditional Cantonese cuisine to International food. If you get hungry, most areas of the park have somewhere to eat or buy a snack. Just remember this is an amusement park and prices of food are usually more expensive than outside the park. If you’re looking to eat somewhere unique to the park, try Neptune’s Restaurant. 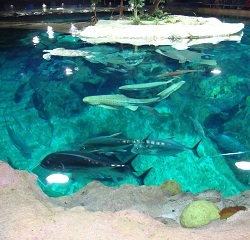 Here you can enjoy the view of the main tank in The Grand Aquarium while enjoying your meal. A very nice view of the Symbio show at night can be seen from the balcony of Neptune’s Restaurant. An amusement park wouldn’t be complete without a visit to some souvenir shops along the way. Ocean Park Hong Kong has lots of these souvenir shops located throughout the park. Each shop has specific items that go with the theme of the store. Take your favourite Ocean Park mascot home with you to remember the fun you had that day. The MTR doesn’t go to Ocean Park, so you’ll have to take a bus or taxi to get here. Some hotels like the Cosmopolitan Hotel offer free shuttle bus services to the park. Check with your hotel to see if shuttle buses are available.